Summary: Twentieth Century Fox Home Entertainment announced today the continuation of summer fun and thrill points as JUDY MOODY AND THE NOT BUMMER SUMMER, the irresistible family comedy based on the best-selling book series, arrives on Blu-ray and DVD on October 11. The first film adaptation of the beloved children’s book series, JUDY MOODY AND THE NOT BUMMER SUMMER, by Megan McDonald with illustrations by Peter H. Reynolds, is a delightfully, laugh-out-loud hilarious treat for adventure-loving kids, tweens and adults. Feisty, fearless Judy Moody (Jordana Beatty) is looking forward to the most super-duper, double-rare summer vacation ever. The trouble is, her parents are called out of town and her BFFs are going away with their own families. That leaves Judy trapped at home with her pesky brother Stink (Parris Mosteller) under the watchful eye of Aunt Opal (Heather Graham). But with a little playful planning - and a lot of imagination - Judy turns a snoresville summer into the way-not-boring adventure of a lifetime! 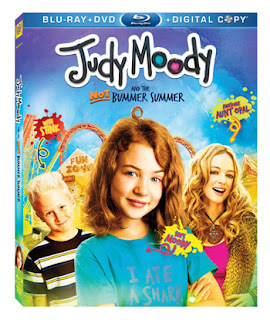 The JUDY MOODY AND THE NOT BUMMER SUMMER Blu-ray and DVD comes with a collectible Judy Moody Activity Book complete with extrathrilladelic games, puzzles, activities and more. Additionally, each Blu-ray and DVD is packed with never-before-seen bonus features including a behind the scenes cast vignette, “10 Things You Didn’t Know About Judy Moody”, an exclusive Camryn Summer Music Video, and much more. The film stars newcomer Jordana Beatty (Superman Returns) as Judy Moody along with Heather Graham (The Hangover, “Scrubs”), Jaleel White (“Psych,” “Family Matters”), Preston Bailey (“Dexter”) and Parris Mosteller (“Worst Week”). John Schultz (Aliens in the Attic) directs from a screenplay by Megan McDonald and Kathy Waugh (Big and Small). Smokewood Entertainment’s Sarah Siegel-Magness and Gary Magness (Precious) produced the film with Bobbi Sue Luther and Andrew Sugarman serving as executive producers. The film was released theatrically by Relativity Media. JUDY MOODY AND THE NOT BUMMER SUMMER is available as a 1-disc DVD or 3-disc Blu-ray Triple Play with Blu-ray, DVD and Digital Copy. ARP is $24.99 for Blu-ray Triple Play and $19.99 for DVD. *I was sent a promotional DVD for this information. I was not given any monetary compensation.